To require your customers accept your terms of service before checkout, enable the Show "I agree with Terms & Conditions" checkbox at checkout by going into your Online Store Control Panel > Settings > General > Legal Pages. This feature ensures all orders include a confirmation of consent. As it is impossible to place an order without agreeing to Terms and Conditions, the fact that an order is placed is a confirmation of consent. 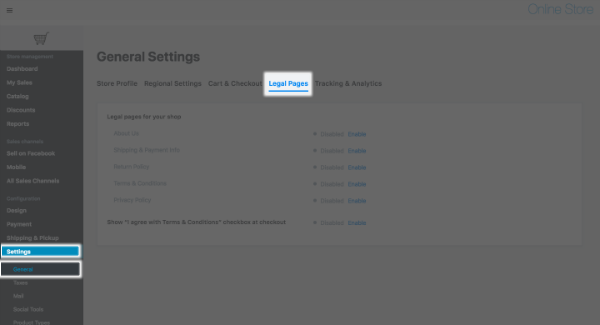 You can enable these pages in your Online Store Control Panel > Settings > General > Legal Pages. Once the legal page is enabled, you can then click Edit to open the page's settings and content form. You can specify any title to your page. 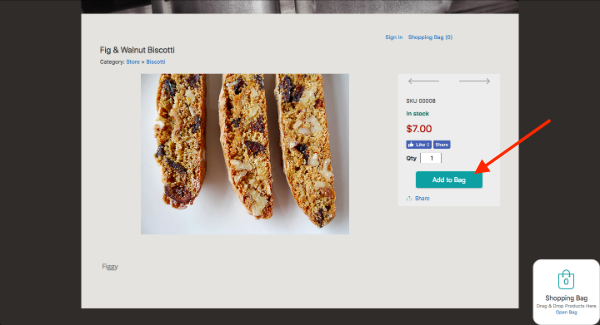 If you already have a similar page on your website, you can add a link to that page here.The pages links will be automatically attached and shown at the bottom of each store page. 1. Enter your Online Store on your website and click on one of your products. 2. 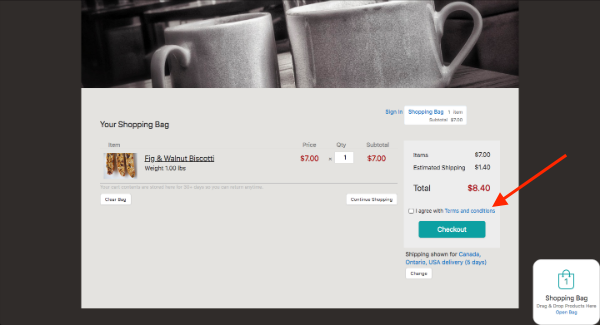 Click Add to Bag. 3. Then click Go to Check Out. 4. Click on the link for Terms of Service. 7. Get the URL from your address bar. 8. Place this URL on your website. * Replace "yourdomain.com" with your domain URL. The legal pages you need and the content they are to display depends on your business, and laws and regulations in your country. We recommend to look for professional lawyer advice regarding this. requirements to use the store, e.g., whether the registration is required, etc. whether you distribute this information to any 3rd party and if so what for, etc. 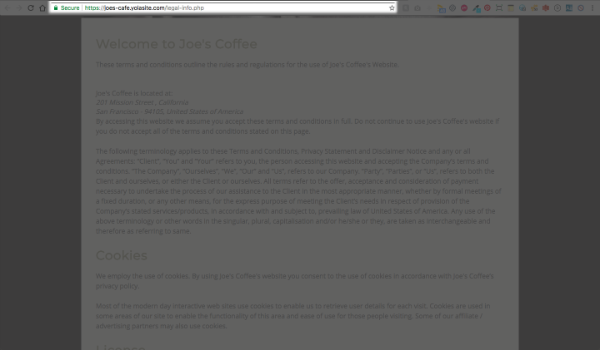 The payment info page should cover all possible questions about payment methods in your store. There are number of online tools for generating various templates for Privacy Policies, and Terms of Service. You can check these services to get the content for your legal pages that would be streamlined and up to date. For example, https://termsfeed.com, http://www.iubenda.com. 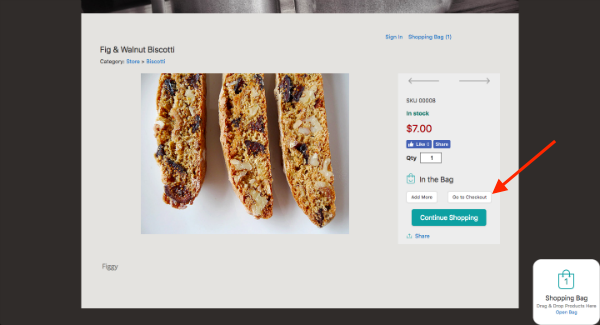 Please remember to check it with professional lawyers before adding the legal pages to your store. In your Online Store you can require your customers to accept terms of service before checkout. 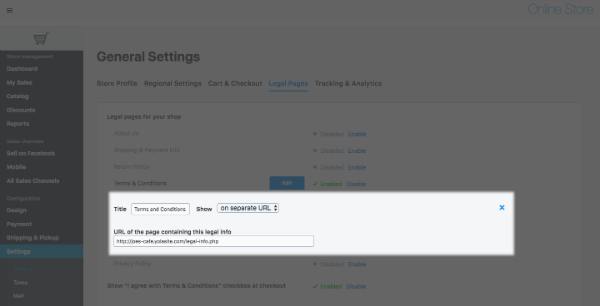 To achieve this simply enable the Show “I agree with Terms & Conditions” checkbox at checkout in your Online Store Control Panel > Settings > General > Legal Pages. 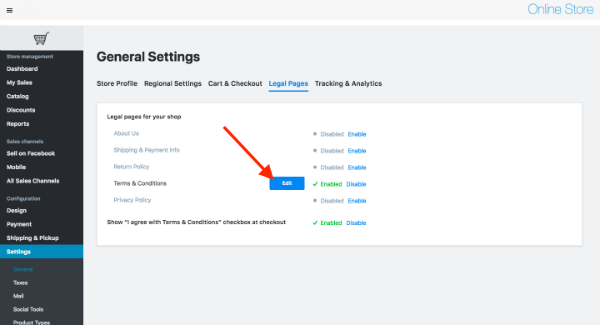 On checkout your customers will see a checkbox and a link to Terms and Conditions and will have to agree to these in order to proceed. As it is impossible to place an order without agreeing to Terms and Conditions, the fact that an order is placed is a confirmation of consent.